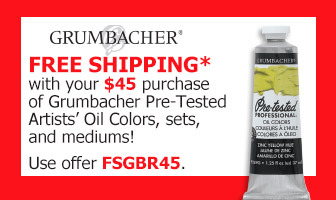 Tested and approved by professionals, for professionals, Grumbacher Pre-Tested Professional Oils have been one of America's favorite oil paints since 1905. Recently reformulated, the line now includes stronger, purer cadmiums and exciting contemporary colors. Grumbacher Pre-Tested Oils are made with the finest pure pigments milled in select alkali-refined linseed oil (with the exception of two whites described below). All 90 colors are highly pigmented, with tinting strength equal to or better than the leading professional brands. Pre-Tested Oils offer high chroma, superior tinting strength, excellent adhesion, outstanding working properties, the utmost lightfastness, and archival permanence. All colors are available in 1.25 oz (37 ml) tubes. Select colors are also available in an economical 5 oz (150 ml) size. A free color chart is available on request. Superba White — Grumbacher's exclusive Superba White is a smooth, buttery, heavy-bodied white ground in non-yellowing poppy seed oil. Superba is unaffected by exposure to light, freely intermixable with other colors, and offers enhanced opacity and tinting strength. Soft Titanium White — Soft Titanium White is a permanent soft-bodied, opaque, non-yellowing Titanium White that is ground in poppy seed and sunflower oils, rather than linseed oil. These oils do not yellow with age, as does pure linseed oil. Soft Titanium White is also recommended for fluid wet-in-wet techniques. Titanium White — Titanium White is a permanent, heavy-bodied, versatile, opaque, pure white that is neutral in hue. It's ideal for applications where great opacity is required, and is considered the strongest tinting white. Zinc White — Zinc White is a permanent, heavy-bodied, semi-opaque, cool white. It's designed especially for brilliant clear tints with all oil colors, and is excellent for glazing.